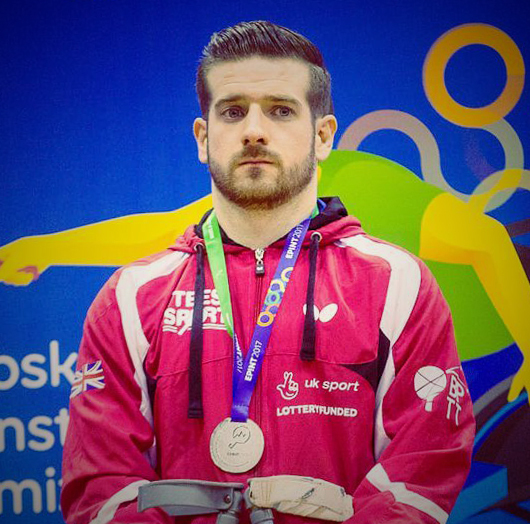 TORPOINT’S David Wetherill picked up a team gold and an individual silver medal at the European Para Table Tennis Championships in Slovenia. The 27-year-old won his silver in the men’s class six singles. Wetherill showed his battling qualities to reach the individual final. He overcame world team gold medallist Alberto Seoane Alcazar of Spain 3-2 in the quarter-finals and then claimed a four set victory over Romanian Bobi Simion, who had defeated Paralympic and defending European champion Peter Rosenmeier. In the final, Wetherill came up against world number Alvaro Valera. He fought hard but lost in four sets and afterwards admitted he had nothing left in his tank after his earlier rounds. “I wanted to make it difficult for him and I didn’t really do that to be honest,” said Wetherill. “I just had nothing left in the tank. I tried my best but in hindsight I should have taken my chances a bit more in the previous rounds as I made it more difficult for myself than it could have been. However, Wetherill did get a gold on Wednesday in the team final to end the championships on a high. He was joined in the Great Britain team by Paul Karabardak and Martin Perry and they overcame Croatia in the final. Wetherill helped get GB off to a great start with a doubles victory with Karabardak over Pavoa Jozic and former world number of Vjekoslav Gregorovic. Wetherill and Karabardak stormed into a 2-0 lead but their opponents came back to level at 2-2 before the GB pair asserted themselves again to win the match 11-4 in the fifth. In the first singles Karabardak came back from 2-0 down to beat Jozic 11-7 in the fifth to securing gold for Britain. “We knew from the start that the doubles would be really important,” said Wetherhill. “And if we could go into the singles 1-0 up then Paul could play relaxed and we would be in a very strong position to take the victory. “At 2-0 up were playing really well and very positive but in the third set we lost a string of points and my confidence dropped a little bit and all of a sudden they were back at 2-2.